An exquisitely well-designed model that offers a little something for everyone. The Infinity Iyashi massage chair is recommended for anyone from chronic pain sufferers to hobbyist users, including taller people up to 6’5”. (*) Note: Brand Reliability is a measure of the strength and longevity of the brand, which by extension, is a measure of the level of support you can expect. Are you looking for a great, all-around massage chair that can cater to a variety of needs, tastes, and preferences? A chair that’s loaded with high-end features, but doesn’t cost an arm and a leg? If you answered yes to either of these questions, then you’re going to love our Infinity Iyashi review. It’s one of the best, most robust massage chairs the company has created to date, designed with mass market appeal in mind. As you will see in the sections below, the Iyashi has something for everyone. If you suffer from chronic pain, there are some powerful therapeutic features that will help make you feel better. It doesn’t matter if you’re limited on space, taller, or simply a hobbyist user looking for as many features as you can get for a reasonable price. You’ll find it all here. Let’s jump right in and take a closer look at the features that drive and define the model to show you what we mean! The Iyashi gets off to an exceedingly strong start by being built around cutting edge massage chair technology. The hybrid L/S Track is state of the art in the industry. It provides all the benefits of the industry-standard S-Track, which allows the quad rollers to follow the natural curve of your body’s spine. Plus, it has a track extension that continues under the seat, allowing for a roller-based glute and thigh massage. The 49” massage track isn’t quite the longest in the industry, but it’s not far from it. So, it still enables the Iyashi to render something close to a full-body roller-based massage. Working in tandem with the technologies mentioned above, 3D body scanning enhances the overall massage quality by taking a scan of your back before you begin your selected program. Once the scan is complete, the chair makes automatic adjustments to the position of the rollers to ensure that they hit the pressure points on your back. Should this automated approach fail, the Iyashi provides a means of manually adjusting both the roller positions and the width of the massage field via buttons on the remote. Taken together, this approach guarantees you a perfect massage experience, every time you use the chair. This is a big win for the design. In fact, our Infinity Iyashi review would not be complete if we wouldn’t call particular attention to it because it makes the chair more appealing to people for whom space is an issue. Let’s face it; massage chairs are big. They tend to fill up whatever room they’re in, which can be problematic if you live in a smaller home or an apartment. While space-saving technology doesn’t eliminate the issue, it goes a long way by minimizing the space you have to set aside for the chair’s use. The Iyashi only requires five inches of clearance between the back of the chair and whatever wall you set it near. The Iyashi massage chair also offers two Zero-G seating positions, available at the touch of a button. This also enhances the overall massage experience by reclining the user to a position where the knees are elevated slightly above the heart. From this position, most of the body’s weight is pressing down and against the rollers. As a result, the chair is able to render a deeper, more penetrating, and ultimately more satisfying massage. 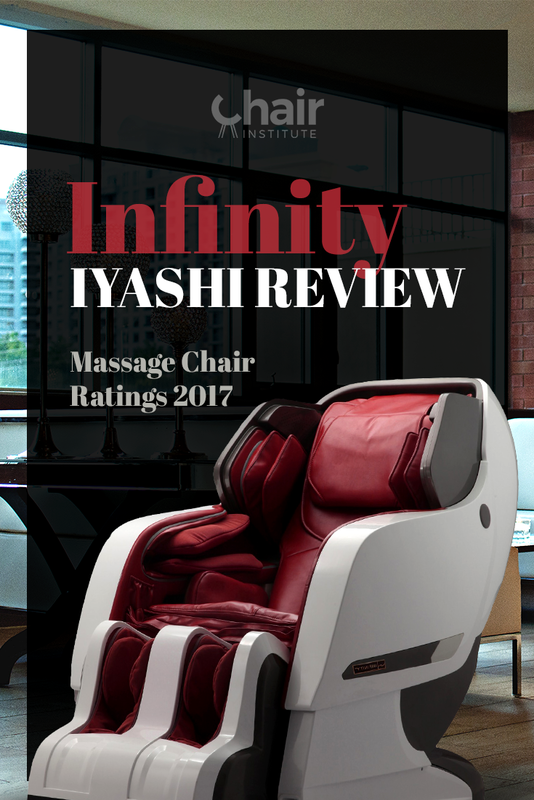 Infinity has a reputation for offering more customization options and massage combinations than the companies it competes with at any given price point, and the Iyashi is no exception. So, it has the basics covered plus one advanced massage technique. Two things to note here, though. Most companies that offer a combination massage offer Kneading and Tapping together. Infinity’s decision to combine Tapping and Knocking is a bit off the beaten track and provides a very different experience that many of the Iyashi’s users enjoy. It’s well worth experimenting with to see how you like it! The other thing to note here is the Rhythm function. While not a proper massage “technique,” it is interesting and worth your time to experiment with. It ties into the music function of the chair and sets the rhythm of the massage rollers to the beat of whatever music you’re listening to. Combine Zero-G seating, rhythm massage and say classical music, and you’ll likely get so relaxed that you fall asleep during your massage. Combine those features with heavy metal, and you’ll have an entirely different experience! It gets even better, though. Because, on top of all that, you can customize your experience via six speed and intensity settings from the remote, which gives you a mind-boggling number of combinations to enjoy. It should also be noted that at maximum intensity, the massage experience is robust enough to be considered a real deep tissue massage. Taken together, this is an incredibly strong feature implementation and one of the hallmarks of the design. The Iyashi massage chair renders its air massage via 38 Second Generation Airbags. This is on par with most of the chairs offered by other manufacturers in the Iyashi’s price range. There are two aspects of Infinity’s feature implementation, though, that make it superior to the offerings by their competitors. Second, where most other companies only offer three intensity settings, the Iyashi offers six. This gives you many more customization and personalization options. Indeed, an excellent implementation by any reckoning. Our Infinity Iyashi review would not be complete without drawing particular attention to the body stretch feature as it provides more therapeutic value and more immediate pain relief than any other single element in the design. Body stretching provides almost instant pain relief by taking pressure off compressed discs in your spine in the same way that a chiropractic adjustment does. Compressed discs are the leading cause of chronic back pain. If it’s something you suffer from, then this is likely to become your favorite feature. But, be warned. Although the manual describes this as a gentle stretch, it’s actually quite robust. So, if your pain is especially severe, you may find this too intense. The chair offers two solutions if this is the case. First, you can start with a regular massage that combines heat therapy (describe below), before moving into the stretch routine. Second, you can use the Twist function which we’ll cover next. At first glance, many people find it strange that a chair would offer both a body stretch and a twist function since both provide the same basic benefit. When you think about it, though, there’s a lot of synergy here. While the body stretch feature is quite robust, the waist twist is much gentler. So, if you find that the stretch is too much for you, you can downshift to the twist without losing therapeutic value. Another excellent design decision by Infinity. Yet another powerful feature, heat plus massage provides tremendous therapeutic value. Regarding implementation, there’s nothing unique or remarkable here. The offered heat is binary, limited to the lumbar area, and has no means of precise temperature control. Even so, if you suffer from chronic lower back pain, you’ll find yourself using this on an almost daily basis. This is another thing that Infinity does very well. One that further increases the number of massage options and combinations available to you. The Zone massage function allows you to interrupt whatever program is running when the rollers hit a sensitive spot on your back. Pressing the button will make the rollers focus on an area six inches in diameter from wherever the button was pressed. Pushing it again will cause it to exit Zone massage mode and return to the massage in progress. Partial massage mode operates on the same principle, but has a larger area of effect. It encompasses roughly one-third of the back from wherever the rollers are when the button is pressed. As before, pushing it again will return to the massage program you were running before you entered this mode. More than half of the Iyashi’s airbags are in the leg massage ports, so the quality of the leg massage is exquisite. While the calf massage is rendered entirely by airbags, the foot massage utilizes a combination of airbags and dual foot rollers. Even better, there’s some level of customization here. The foot roller speed can be adjusted via the remote through three different speed levels. That’s especially noteworthy because most chairs that provide a roller-based foot mas﻿﻿sag﻿﻿e don’t offer any way to customize the experience. If you spend a significant amount of time on your feet, this will be one of your favorite perks of the chair. A superb feature implementation. While music support doesn’t directly impact the quality of a massage, it does enhance the overall experience. In this case, Infinity’s feature implementation is quite strong. The speakers located in the headrest are Bluetooth compatible. So, you can sync your phone and listen to music from there. The only wrinkle to make a note of here is that while most massage chairs that offer this functionality have volume controls on the remote, the Iyashi does not. To control the volume, you must use your smartphone. The implementation isn’t better or worse, but something to take note of. This is a minor feature, but one that some people swear by. In fact, it adds a nice bit of polish to the design as a whole. If you dim the lights during your massage, you’ll be treated to the soft glow of blue LED lights on the sides of the chair, which can help you relax. Combine it with some music, and you just might doze off while enjoying your massage! Building on the “something for everyone” design philosophy that defines the Infinity Iyashi massage chair, the model features an extension module in the Ottoman which allows it to accommodate users up to 6’5” in height. Only about a quarter of the massage chairs on the market today are built for users this tall. Of those, only a handful offer a significant array of therapeutic benefits. This automatically puts the Iyashi on the short list for taller chronic pain sufferers. All massage times default to a twenty-minute duration. But it can be adjusted to either ten or thirty minutes at your preference. This is not as robust an implementation as you find in other chairs, which allow for more fine-grained control over massage times. Even so, the fact that massage times are adjustable at all is a net positive for the design. You can tell that the folks at Infinity put some extra time and effort into the design and layout of the remote. This is because despite having a number of features on offer, the Infinity Iyashi zero gravity massage chair is still one of the easiest to use that we’ve ever come across. In addition to the fact that there’s no significant learning curve involved, the company has even provided an app-driven interface for both iOS and Android devices that allow you to control the chair via your smartphone. It takes a few extra steps to get the app set up and installed. And honestly, after trying both the remote and the app, you’ll probably find the app to be more convenient. Even if you don’t, however, you’ll have no trouble at all navigating your way to any feature you want from the remote provided. A genuinely excellent job by Infinity! As you can see from our Infinity Iyashi massage chair review to this point, this model has a lot to offer to a broad swath of the market. It delivers enough massage benefits on tap to thrill chronic pain sufferers, but gentle enough to be fantastic for casual users as well. It’s also suitable for people for whom space is a concern. And of course, taller users will be thrilled to find such a full-featured chair that will accommodate them. Having said that, as good as the chair is, there’s always room for improvement. Calf Heat – This would be a superb addition that would add even more therapeutic punch to the chair. Precise Heat Controls – A convenience feature that would add even more options to the design. Adjustable Intensity Settings for the Foot Rollers – This seems like an easy addition since Infinity already has an adjustable speed function for the foot rollers. Other than that, though, we can’t find any faults with the design. It’s rock solid. There’s no other way to say it: the Iyashi is a stellar design. It’s filled with features almost everyone will appreciate, and is incredibly user-friendly. Here, we should probably say something about the Infinity Iyashi price. It costs less than you might think. Most chairs that offer this range of functionality and therapeutic benefit have a high-end price tag. But, the Iyashi is a solidly mid-range chair, making it a pleasant surprise indeed. We recommend this chair without reservation to anyone. It is a rare combination of form and function, offered at an outstanding price. Infinity Iyashi Massage Chair User Manual. Infinity Massage Chairs Mobile Apps Guide. Shiatsu Massage Therapy for Optimal Health, Acupuncture and Massage College. Migraine headaches are reduced by massage therapy, Miami Research Profiles.